As part of The Pixel Project’s Read For Pixels campaign, we interview authors from genres as diverse as Science Fiction and Fantasy to Romance to Thrillers about why they support the movement to end violence against women and girls. 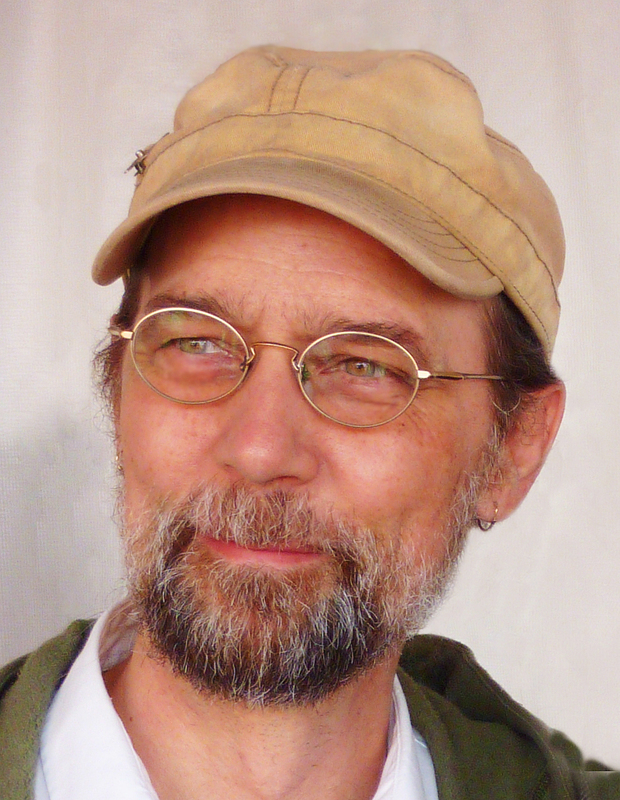 In this interview, we talk to Charles de Lint who is the author of more than seventy adult, young adult, and children’s books. Renowned as one of the trailblazers of the modern fantasy genre, he is the recipient of the World Fantasy, Aurora, Sunburst, and White Pine awards, among others. Modern Library’s Top 100 Books of the 20th Century poll, conducted by Random House and voted on by readers, put eight of de Lint’s books among the top 100. Charles’ latest book, THE WIND IN HIS HEART, will be released on September 19th, 2017. Charles will be taking part in the 4th annual Fall Edition of the Read For Pixels campaign by donating a one-of-a-kind perk to help raise funds for The Pixel Project – a perpetual place on his private mailing list through which he sends out a haiku a day to about 25 friends. This is available for one (1) generous donor only! More details will be available once the Read For Pixels campaign (including the fundraising page with this goodie on it) kicks off on 1st September 2017, so check out The Pixel Project’s Facebook page and Charles’ Facebook page in September 2017 for the link to the fundraising page to donate to the campaign. If you’d like to have a chance to participate in live Q&As online with 12 other award-winning bestselling authors who will be having live Read For Pixels Google Hangouts, check out the schedule here. Picture courtesy of Charles de Lint. 1. Why is ending violence against women important to you and why did you decide to take action about it by supporting The Pixel Project? I don’t just believe in gender/religious/racial equality. I genuinely can’t understand why anyone would think it’s okay to bully or harm another human being. To do our part in eradicating violence, it’s incumbent upon each and every one of us to do everything in our power to stop this ugly behaviour by nurturing mutual respect and kindness using whatever platforms we have. Mine is simply by portraying all the characters in my fiction as equals, with the strengths and weaknesses that any of us might possess. I don’t get preachy about it, but I’ve written plenty of fiction dealing (in part) with violence against women, kids, and marginalized people, and I’ve heard from many readers that they gained strength or felt empowered because they felt less alone and found role models to look up to. I’ve also had the honour of hearing from counsellors and ministers who’ve used my fiction in their work, and everyday people—even prisoners—who’ve affirmed that my writing helped them look at issues in a different light. I can’t imagine a more gratifying response to one’s creative output, and it sustains me even when my writing hits all the inevitable potholes and such. 2. You have very generously offered a perpetual spot on your private Haiku mailing list to one generous donor in the upcoming Read For Pixels fundraiser. Aside from helping raise funds to keep anti-violence against women work going, what do you think authors can do to help stop violence against women? The interesting thing about stories is that they aren’t a passive art form. Well-written stories allow the reader to invest their imagination in the reading process and part of that investment is to immerse oneself in the lives of the characters you meet in the pages. Aside from great entertainment value, which is important to me, a major side benefit is that the reader can come away with a tangible understanding of how the “other” is not so different from oneself. Every “other,” from refugee to the opposite gender, can be understood and, more importantly, empathized with, if you can experience the world through their eyes. Authors don’t need to lecture. They only need to depict truthful stories that, as they unwind, show readers that treating others as we’d like to be treated ourselves shouldn’t be considered freakish behaviour, but rather the norm. 3. As a prominent male author, what do you think men can do to help stop violence against women? It’s pretty basic. Just as we shouldn’t let racist comments from our friends and acquaintances slide, neither should misogynist comments or jokes go by without questioning them. You don’t have to get heavy about it. Even just saying, “I don’t understand,” as often as necessary to someone trying to justify it to you, sends a clear message that this attitude no longer flies. Speak up when you become aware of something that’s not right, be it trolls on the Internet or some jerk on the street. And always be a rock for those who might need our support. Treat your partners and women friends with the genuine respect and honesty they deserve. One more thing: read women writers and recommend their books to your male friends. What better way to get inside the workings of the female mind than to look at the world through their lens and voice? I believe it’s entirely possible to create a new normal and I can only do my best to set a positive example in my daily life and my creative work. 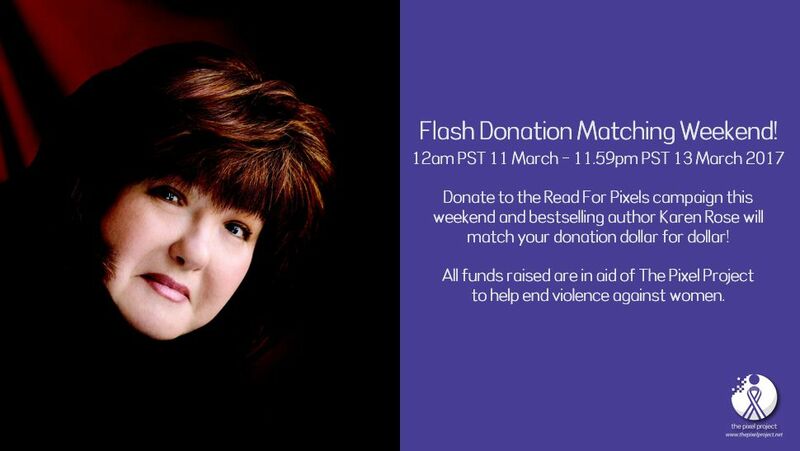 MARCH 8TH 2017 (WORLDWIDE): The Pixel Project, a 501(c)3 anti-Violence Against Women non-profit, is thrilled to announce the first ever Read For Pixels Flash Donation Weekend courtesy of New York Times bestselling mystery/thriller author Karen Rose which will take place from 12am PST March 11th 2017 to 11.59pm PST March 13th 2017. Ms. Rose has pledged a dollar-to-dollar match for up to a maximum of $4000 in donations made to the Read For Pixels 2017 (International Women’s Day Edition) campaign during this period. Ms. Rose’s generous pledge covers any donations coming in via the Read For Pixels (IWD Edition) fundraiser during these three days whether they are made by book fans in order to get exclusive perks and goodies from their favourite authors or are standalone donations. To encourage her global fan community to support the cause, Ms. Rose will also make several unique goodies available on the Read For Pixels fundraising page to reward her fans worldwide for donating. These include 1-to-1 Skype calls for individuals and book clubs as well as goodie bundles comprising her books or series paired with hand-knit items that she has personally made in support of the Read For Pixels campaign. In addition to Ms. Rose’s contributions, all perks and goodies donated by authors and publishers for the campaign will be released just in time for the 11th March kick-off of the Flash Donation Matching Weekend. There will exclusive goodies from the 11 other Read For Pixels authors including Aliette de Bodard, Jacqueline Carey, Karen Chance, Kendare Blake, Kristin Cast, Laini Taylor, Mary Robinette Kowal, Michelle Hodkin, Michelle Sagara, Shannon Mayer, and Tessa Gratton. Additional goodies come courtesy of Penguin Random House’s Berkeley and Ace/Roc/Daw imprints, acclaimed Fantasy authors Anne Bishop, Darynda Jones, Diana Gabaldon, Kate Elliot, Keri Arthur, Kimberly Derting, and many more. All funds raised are in support of The Pixel Project’s Celebrity Male Role Model Pixel Reveal campaign which aims to get men and boys on board the cause to end violence against women while raising US$1 million to keep The Pixel Project’s anti-Violence Against Women campaigns, programmes, and initiatives alive. Award winning, internationally bestselling romantic suspense author Karen Rose earned her degree in Chemical Engineering from the University of Maryland. She lived in Cincinnati and worked in the engineering field for years before she began writing novels in 2003. Rose currently lives in Florida. Connect with her online at karenrosebooks.com, and facebook.com/KarenRoseBooks. NOVEMBER 25TH, 2015 (WORLDWIDE):The Pixel Project (www.thepixelproject.net), a global, virtual anti-Violence Against Women non-profit, is proud to launch the 6th annual “16 For 16” blogging campaign in support of the 16 Days of Activism Against Gender-based Violence. The campaign runs from 25th November – 10th December and aims to raise awareness about Violence Against Women (VAW) through 16 articles about VAW. The campaign also provides supporters with a way to donate to the cause without breaking the bank during the year-end holiday season. This is also the first year that the fundraising component of the “16 For 16” campaign will be anchored around the annual #GivingTuesday fundraising day that takes place on the first Tuesday of December. In line with the last 5 years, The Pixel Project will publish one blog article for every day of the 16 Days of Activism. Each article presents a list of 16 positive ideas, solutions, and people revolving around specific topics related to understanding, preventing, stopping and ending VAW. Each article addresses different demographics and communities. Each idea and solution is bite-sized – simple to understand and easy for the layperson to put into action. This year’s articles include The Pixel Project’s annual lists of 16 Female Role Models, 16 anti-VAW films, 16 positive and empowering songs, 16 anti-VAW Facebook pages, and 16 anti-VAW Twitter accounts. Other articles run the gamut from 16 anti-VAW filmmakers to 16 ideas for kids and teens to take action against VAW to 16 anti-VAW public service announcements. This year, the “16 For 16” fundraiser is held on Indiegogo and will run for the full 16 Days of Activism – a period which also encompasses #GivingTuesday. All funds raised will go towards supporting the Celebrity Male Role Model Pixel Reveal campaign, which aims to raise US$1 million in aid of The Pixel Project and the USA’s National Coalition Against Domestic Violence. 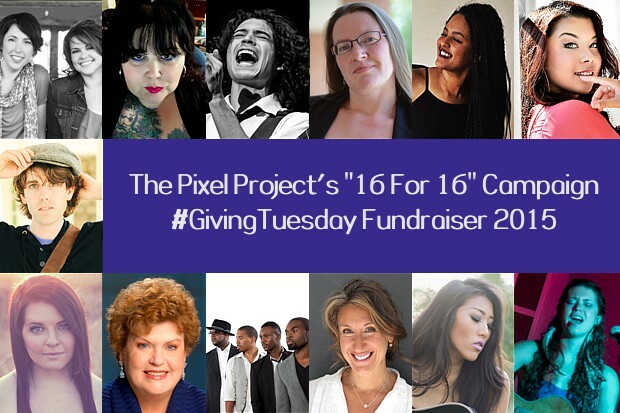 The Pixel Reveal campaign has raised $23,773 (23,773 pixels revealed) to date and is aiming to reach the $25,000 (25,000 pixels revealed) fundraising milestone through the “16 For 16” #GivingTuesday fundraiser. 8 music artistes and 5 authors have generously donated a range of exclusive goodies to help The Pixel Project encourage music fans and book lovers to donate this holiday season. These include: One-of-a-kind opportunities to become a minor character in upcoming books by acclaimed authors, original songs written for donors, 1-to-1 Skype concerts, exclusive author swag, and more. In addition, Grammy Award winner Colbie Caillat has donated an autographed ukulele that will be available as a thank you gift for one generous donor. Donations begin at as little as US$10 and the goodies are available to donors as “thank you” gifts and perks depending on the donation amount. Participating award-winning bestselling authors include Charlaine Harris, Christina Lauren, Elizabeth Bear, Jane Green, and Yasmine Galenorn. Participating music artistes include rising artistes, Indie singer-songwriters, and YouTube stars such as AHMIR (YouTube’s #1 R&B band and The Pixel Project’s YouTube Ambassador), Adam Web, Alexis Umathum, Hannah Wondmeneh, Juliet Weybret, Mary Scholz, Miguel Dakota, and Olivia Thai. For more information about the “16 For 16” campaign, visit: http://bit.ly/16Days. The Pixel Project is a complete virtual, volunteer-led global 501(c)3 nonprofit organisation whose mission is to raise awareness, funds, and volunteer power for the cause to end violence against women using a combination of social media, new technologies, and popular culture/the Arts. Their flagship initiative is the Celebrity Male Role Model Pixel Reveal campaign which aims to turbo-charge global awareness about VAW using social media while raising US$1 million by getting a global audience to collectively unveil a million-pixel mystery collage of Celebrity Male Role Models at US$1 per pixel. AUGUST 11th, 2014 (WORLDWIDE): The Pixel Project (www.thepixelproject.net), an anti-Violence Against Women non-profit, will be holding the first “Read For Pixels” 2014 Google Hangout Sessions featuring live Google Hangouts with award-winning bestselling authors in support of the Celebrity Male Role Model Pixel Reveal campaign (http://reveal.thepixelproject.net), which aims to raise US$1 million in aid of The Pixel Project and the USA’s National Coalition Against Domestic Violence (www.ncadv.org). Participating authors include Joe Hill, Ellen Hopkins, Robert J. Sawyer, Cinda Williams Chima, Chuck Wendig, Kevin Hearne, Delilah S. Dawson, Alyson Noel, Jasper Fforde, Sarah J. Maas and G. Willow Wilson. The “Read For Pixels” Google Hangout sessions will run on Friday, Saturday, and Sunday evenings throughout September. Each session will feature an author reading from one of their books and discussing why they support ending violence against women, their writing, and women in the media and popular culture. Each session will also include a live moderated Q&A session for fans and book lovers to ask their favourite authors questions in real time. Participating authors have also generously donated a range of exclusive “goodies” to help The Pixel Project encourage fans and book lovers to donate to the Pixel Reveal campaign including: 1-to-1 Skype chats for fans and book clubs, signed first editions or special editions of participating author books, brand-new Drabbles (100-word stories), a handwritten short story or poem on a postcard, and more. Additional goodies are donated by Bloomsbury Books and Romance author Lori Foster. Donations begin at as little as US$10 and the goodies are available to donors as “thank you” gifts and perks depending on the donation amount. Fundraising will take place throughout September. 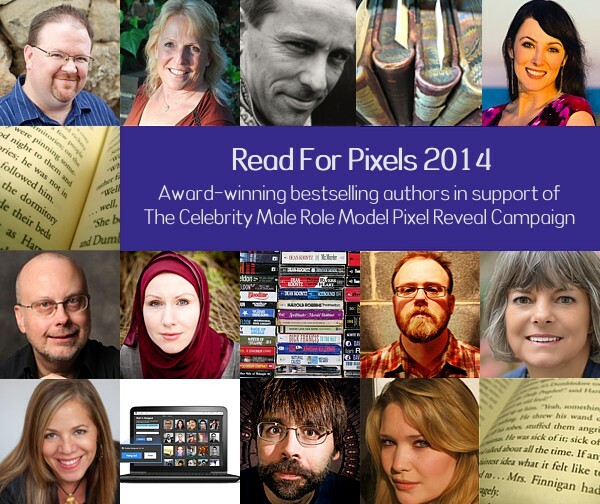 More information about Read For Pixels can be found at: http://is.gd/Read4Pixels2014. 21 JULY 2014 (WORLDWIDE): In an effort to engage small-to-medium independent businesses in the fight to end violence against women, The Pixel Project (www.thepixelproject.net) has launched the “100 For 100” donor program (http://is.gd/100For100) in support of the Celebrity Male Role Model Pixel Reveal campaign (http://reveal.thepixelproject.net) which aims to raise US$1 million to support The Pixel Project and the National Coalition Against Domestic Violence (www.ncadv.org). 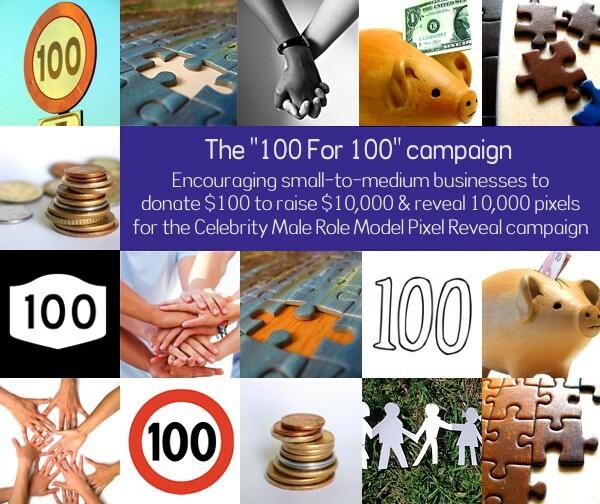 The “100 For 100” donor program, which will run from 21 July – 31 August, 2014, is a simple and affordable way for small-to-medium independent businesses to support the fight against Violence Against Women (VAW) by making a single US$100 online donation to the Pixel Reveal campaign, which rallies the global audience to donate US$1 per pixel to unveil an online million-pixel mystery collage of world-exclusive celebrity male role model portraits. Each US$100 donation will reveal 100 pixels. As more pixels are revealed, the cover picture will fade out to uncover the portraits underneath it. When a celebrity male role model is fully revealed, an exclusive anti-VAW public service announcement from him will be launched to help trigger conversations about VAW, and inspire men and boys to take action to stop VAW. The distinguished line-up includes a Nobel Laureate, a two-time Pulitzer Prize Winner, and a world-renown environmentalist. Participating businesses will enjoy a special “100 For 100 Donor Privilege Package” which doubles as tools for them to help spread the word about stopping VAW. This package includes: The “100 For 100″ donor logo gallery on the Pixel Reveal campaign website where visitors can click on each logo to be taken to the donor’s business website; A Pinterest “100 For 100″ logo gallery featuring “100 For 100″ donor logos; a special badge that “100 For 100” donors can embed on their website; a weekly blog announcement featuring the logo and bios of all “100 For 100″ donors for that week, which will be shared with The Pixel Project’s Facebook and Twitter supporters as well as NCADV’s Facebook page; a special “100 For 100″ testimonial page featuring participants’ supporting quotes together with their founder/CEO’s head shot; and a short 3-question written interview about why they support ending VAW, which will be published as part of the special “100 For 100” interview series starting in October 2014 (Domestic Violence Awareness Month). Through this package, “100 For 100” donors could reach a potential new audience comprising The Pixel Project’s active 35,000-strong online social media community as well as NCADV’s 65,000-strong Facebook page. More information about how businesses can become “100 For 100” donors can be found by visiting: http://is.gd/100For100. “100 For 100” donations should be made directly via http://www.razoo.com/story/The-100-For-100-Campaign. Participating business will receive an e-receipt (tax-exempt for U.S.-based businesses) via email as well as a separate email with a unique link showing them the pixels they have helped to reveal. The Pixel Project is a complete virtual, volunteer-led global 501(c)3 nonprofit organisation whose mission is to raise awareness, funds and volunteer power for the cause to end violence against women using a combination of social media, new technologies, and popular culture/the Arts. Their flagship initiative is the Celebrity Male Role Model Pixel Reveal campaign which aims to turbo-charge global awareness about VAW using social media while raising US$1 million by getting a global audience to collectively unveil a million-pixel mystery collage of Celebrity Male Role Models at US$1 per pixel. The US$1 million will be used by The Pixel Project and NCADV to strengthen efforts to end VAW. 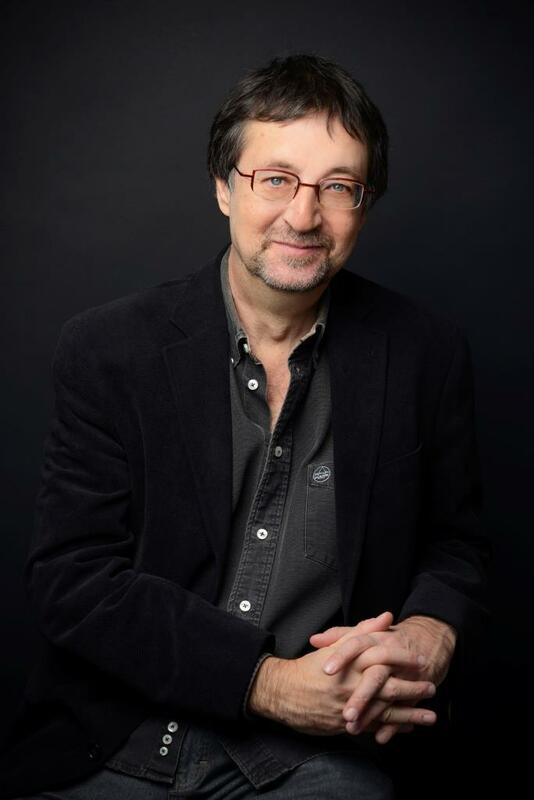 The Pixel Project and Guy Gavriel Kay, award-winning bestselling author of The Fionavar Tapestry trilogy and Sarantium diptych, are proud to jointly present the Double Drabble Pixel Fundraiser in support of the Celebrity Male Role Model Pixel Reveal campaign which aims to raise US$1 million in aid of The Pixel Project and the National Coalition Against Domestic Violence. The Double Drabble Pixel Fundraiser runs from 1 May – 14 May 2014. Donors who donate US$50 will have a choice of one of the Drabbles and donors who donate US$75 will receive both Drabbles. Supporters are happily urged to acquire both Drabbles at the discounted donation level and they can make their donations online via the Pixel Reveal campaign donation page or the Razoo donation page for the campaign. Mr Kay took some time out of his busy schedule to talk to us about why he supports The Pixel Project and the importance of stopping violence against women. I have long believed that one of the true measures of any society or culture is how it recognises and benefits from the status of women. Violence is utterly antithetical to that. This campaign is a natural fit for my lifelong views on the subject. 2. You have very generously written two exclusive Drabbles (100-word stories) for the Double Drabble Pixel Reveal Fundraiser in support of The Pixel Project’s Celebrity Male Role Model Pixel Reveal campaign. What do you think authors can do to help stop violence against women? Authors – male or female – are people first. We have no ‘special’ status, only a shared responsibility to our world, and to the next generation. Those of us with some level, however modest, of name recognition and people who respect our work and thought, can use that good fortune to share our views and invite readers to support the causes that matter to us. 3. As a father and a prominent author, what do you think men can do to help stop violence against women? Education, enlightenment, awareness, respect. Part of parenting is the attempt to instill important values in our children. The notion that violence against women, worldwide, and in our own communities, is unacceptable is one of the things we need to convey. Person by person, generation by generation, we can change the way people think and act. Credits: Author’s portrait by Samantha Kidd Photography.